FC Barcelona is one of the wealthiest football (soccer in United States) clubs in the world. FC Barcelona has a museum dedicated to the club. It is the most often visited museum in Barcelona. Five of the seven main beaches in Barcelona were created prior to Barcelona hosting the 1992 Summer Olympics. Barcelona is divided into 10 districts including Ciutat Vella, Eixample, Sants-Montjuic, Les Corts, Sarria-Sant Gervasi, Gracia, Horta-Guinardo, Nou Barris, Sant Andreu, and Sant Marti. Many people in Barcelona prefer to walks as there is an accident approximately every 19 seconds, making it a rather risky city to drive in. In 1999 Barcelona received a Royal Gold Medal for architecture from the Royal Institute of British Architects. It is the only city to receive the honor that is usually given to an individual or group. 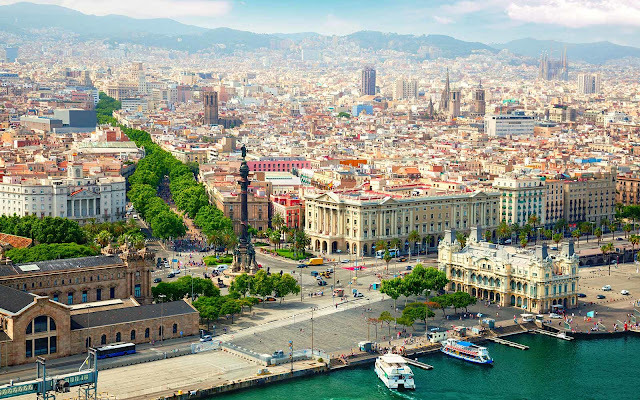 The 9 UNESCO World Heritage Sites in Barcelona include Park Guell, Palau Guell, Casa Mila, Casa Vicens, La Sagrada Familia, Casa Batllo, Palau de la Musica Catalana, Hospital de Sant Pau, and the Crypt of the Church at Colonia Guell. There are 9 UNESCO World Heritage Sites in Barcelona. Seven of them were designed by the same architect who is responsible for the design of the Sagrada Familia. The Sagrada Familia is a cathedral that is being built in Barcelona. It has been under construction since 1882 and is expected to take at least 200 years to complete. The Columbus Monument in Barcelona was built in 1888. It was meant to honor Christopher Columbus and to remind people that he reported to King Ferdinand V and Queen Isabella I first, when he returned from his first voyage. The largest cruise port in Europe is located in Barcelona - the Port of Barcelona. Following London, and Paris, Barcelona is the third most popular tourist destination in Europe. Barcelona is a popular tourist destination with approximately 8 million visiting the city each year. Barcelona's official languages are Catalan and Spanish. Barcelona is located along the Mediterranean Sea. Barcelona, which is the capital of Catalonia, is one of four provinces in the autonomous community. The other three include Tarragona, Lleida, and Girona. Some believe that Barcelona was founded by Hercules. Some believe that Barcelona may have been named after Hamilcar Barca, a Carthaginian general who may have founded Barcelona in the 3rd century BC. In the Middle Ages Barcelona was known by several other names including Barchinona, Barchenona, Barcalona, and Barchchelonaa.